"Actually, we're, uh, not talking at the moment." What qualifies a film as a cult classic? That term is thrown around quite liberally, but most people associate the term with time-honored projects like The Evil Dead, The Rocky Horror Picture Show, and Re-Animator. It used to be that the only way to catch these hidden gems was at a midnight screening or if you were lucky enough to have the right cable TV channel on late some Saturday night. Now, the DVD boom and greater theatrical exposure have made cult films much more accessible, therefore challenging their very (albeit inferred) definition. 1978's Long Weekend truly does deserve the "cult classic" moniker, though, as it simply embodies everything the aforementioned gems brought to the table. 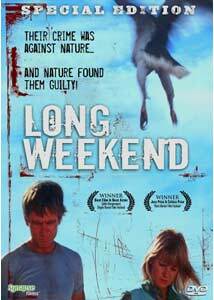 Long Weekend was directed by Australian Colin Eggleston (Fantasm Comes Again) and written by Everett De Roche (Patrick), and the pair have crafted a genuinely creepy thriller. Atmosphere is key to this film, with the Australian setting adding immeasurable value to the story, and the numerous close-up shots drawing us right into the claustrophobic nightmare that a pair of struggling spouses find themselves in. The spouses in question are Peter (John Hargreaves) and Marcia (Briony Behets), a pair who are about to embark on a weekend camping trip in their native Australia. When a bleary-eyed Peter runs over a kangaroo on the way to the campsite, it proves to be a bad omen, to say the least. There is obvious tension between these two, as they are going on this trip to save their marriage. While Marcia is not aware of Peter's latest road kill victim, she soon encounters the campgrounds' many slimy inhabitants. They meet various snakes, vultures, and animals that are native to Australia, all of which seem to have some sort of chip on their shoulder. This is a film that just has to slowly unfold to be effective. The plot isn't particularly complicated, but there are many layers to what we actually see on screen and what is inferred, meaning that any further plot synopsis would simply be a cheat to those who haven't seen it. Long Weekend has so many things going for it that it's amazing just how obscure it is outside of Australia. Hargreaves and Behets are phenomenal in the lead roles, creating just the right amount of tense yet reserved love between them throughout the film. We aren't told up front why the tension exists, and the film is all the better for this subtle approach. There are plenty of gradual reveals, which, along with the mounting natural terror, keep the overall level of fear at a near boiling point. This is how to make an effective thriller, an art that is sadly in need of a renaissance. The opening shot of a bug of some kind scaling a rocky wall perfectly sets the tone for the overall man vs. nature theme of the film. This often signals some form of schlocky, mutated form of an actual insect or animal of some kind. Long Weekend is the only other example of this old movie trend (the other is Hitchcock's classic, The Birds), where the project doesn't settle for the cheesy clichés of its counterparts. This is powered by a tightly written screenplay that really has us contemplating the impact and degree of revenge that nature does take on our protagonists. While their fates are decided by the creatures they have wronged, the way in which the film ends is terrifically original. The last 10 minutes are unforgettable, and reason enough that this more than deserves a bigger audience. Image Transfer Review: When it comes to restoring old, probably messy source material, this anamorphic 2.35:1 widescreen presentation is exactly how it should be done. The gorgeous waterfront camping area looks magnificent, blistering with bright colors. When the sun is shining, we get perfectly rendered brightness, and the nighttime sequences are aided by solid blacks and shadow levels. The first 15 minutes or so do remind us of the film's age, but this is only a result of some grain and dirt that are virtually unnoticeable once the story really kicks into gear. Audio Transfer Review: Long Weekend can be watched with either the film's original mono soundtrack or a brand new, amazing Dolby Digital 5.1 mix. Most older films with 5.1 mixes on DVD don't feature many more dynamic upgrades than that music and sound effects are louder. This new track, though, brings the surrounds to life, cranking up the atmospheric effects and allowing us to hear each and every ambient sound that the characters encounter on their trip. I really didn't expect this picture to scare me much at all, but the various surprising sounds that pop in and out of the rear speakers were enough to make me turn a few more lights on in the house. 1 Feature/Episode commentary by Producer Richard Brennan and cinematographer Vincent Monton. Extras Review: A trio of extras are on board, and even the theatrical trailer that's here is worth a look. There's also an audio commentary featuring producer Richard Brennan and cinematographer Vincent Monton. This new track is full of very interesting, often heart-warming anecdotes about the making of Long Weekend, including plenty of reflections on what it was like working with director Colin Eggleston and the two protagonists, John Hargreaves and Briony Behets. The best feature is a stills gallery, a type of extra that hardly ever receives such praise. In this case, the praise is worthy due to the inclusion of an audio interview with John Hargreaves, who has passed away. This track was recorded in August of 1995, when Hargreaves was interviewed by Tony Watts about his acting career. The perfect first part of a double-feature with the recent Open Water, 1978's Lost Weekend challenges us to decide between right and wrong, in the form of humans vs. nature. This virtually unknown project finally gets a chance at major exposure thanks to Synapse's DVD release. The restoration of the film's audio and video might be the best of the year so far, and there are a couple of extras that are worth a look as well.